In the 1920s, thousands of white migrants settled in the Los Angeles suburb of South Gate. Six miles from downtown and adjacent to Watts, South Gate and its neighboring communities served as L.A.’s Detroit, an industrial belt for mass production of cars, tires, steel, and other durable goods. Blue-collar workers built the suburb literally from the ground up, using sweat equity rather than cash to construct their own homes. 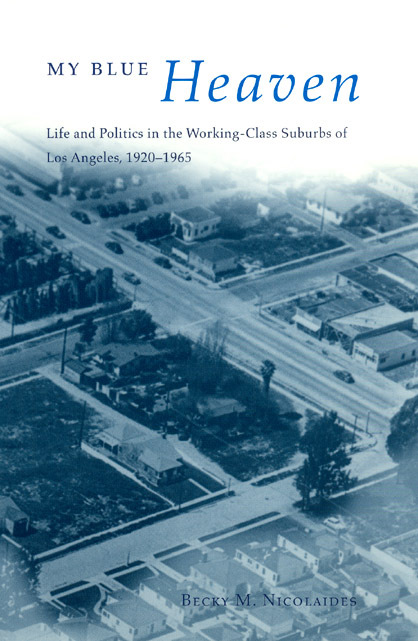 As Becky M. Nicolaides shows in My Blue Heaven, this ethic of self-reliance and homeownership formed the core of South Gate’s identity. With post-World War II economic prosperity, the community’s emphasis shifted from building homes to protecting them as residents tried to maintain their standard of living against outside threats—including the growing civil rights movement—through grassroots conservative politics based on an ideal of white homeowner rights. As the citizens of South Gate struggled to defend their segregated American Dream of suburban community, they fanned the flames of racial inequality that erupted in the 1965 Watts riots.